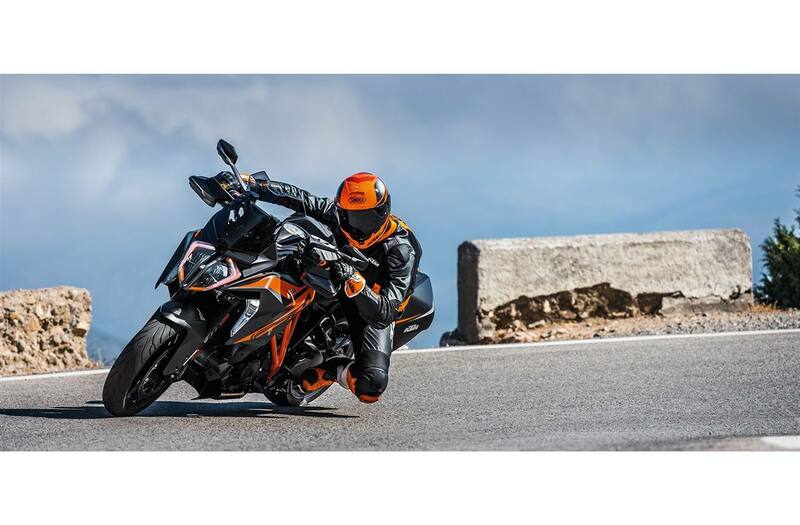 Advanced Sports Touring: The 2019 KTM 1290 SUPER DUKE GT takes the already-proven long-distance performance of the previous GT model and amplifies it even further with added improvements. The same deranged combination that the previous SUPER DUKE GT had of THE BEAST's interstellar V-twin performance with the comfort and equipment needed for all-day, two-up charging - but now intensified with additional enhancements, refinements and new features which further boost performance, while adding to its long-distance hunting skills. There's no replacement for sheer displacement! Based on the advanced 1301 cc engine of the KTM 1290 SUPER DUKE R, the KTM 1290 SUPER DUKE GT is clearly the Alpha within its segment. Featuring updates like titanium inlet valves and revised resonator chambers, this V-Twin packs a powerfully smooth punch. For fully-loaded tours, massive torque from the bottom up means there is less need for extensive gearshifts. Better yet, all this torque means mountain passes are easily dispatched even when fully loaded with a passenger. Cruise Missile: The KTM 1290 SUPER DUKE GT's BEAST-derived powerplant perfectly fits its sovereign appearance. With 175 hp and 141 Nm of torque, it's as much a superbike slayer as it is a coastal road cruiser. A unique mix of the highest quality components, such as titanium inlet valves, have also combined to create overall reliability and allowing for service intervals of 15,000 km. That's a lot of touring! An absolutely key element in the outstanding performance and smooth response of the 1,301 cc 75° V-twin are the unit's cutting-edge four-valve cylinder heads. These combine twin-plug ignition, flow-optimized ports, lightweight titanium valves and resonator chambers for the smoothest twin in town. When you're traveling two-up, the last thing you want is a jerky throttle. KTM have worked the EFI mapping, in combination with the plain bearing and timing, to transfer low-down power to the road with less vibration and reduced engine noise. The responsiveness and free-revving nature of the KTM 1290 SUPER DUKE GT's engine is thanks to the low reciprocating weight of its crankshaft. 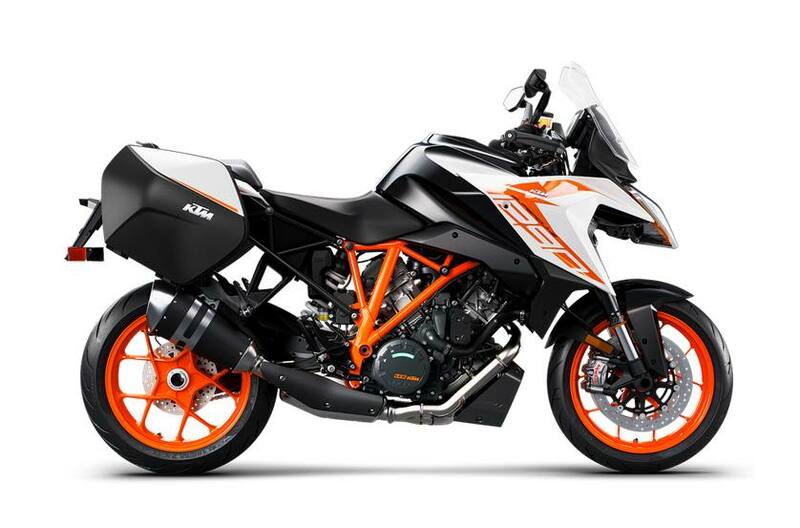 The KTM 1290 SUPER DUKE GT's exhaust system is made entirely from rustproof stainless steel and is Euro IV homologated. Hundreds of test bench runs and complex simulations ensured that the exhaust system, which is using an exhaust flap, contributes decisively to the extremely smooth torque curve and excellent emission values of the powerful twin-cylinder. And did we mention the sound? While it whispers at low revs, it will take your breath away reaching for the high notes. The KTM 1290 SUPER DUKE GT's chassis is a high-tech wonder. The challenge: house the immense V-twin power without compromising high-performance, long-distance capabilities, both on track or public roads. Using high-end components and cutting-edge technology, the almost impossible balancing task needed to create the GT was achieved thanks to complex chassis modelling, development and construction processes and technologies. Built For Comfort: The hint is in the name. 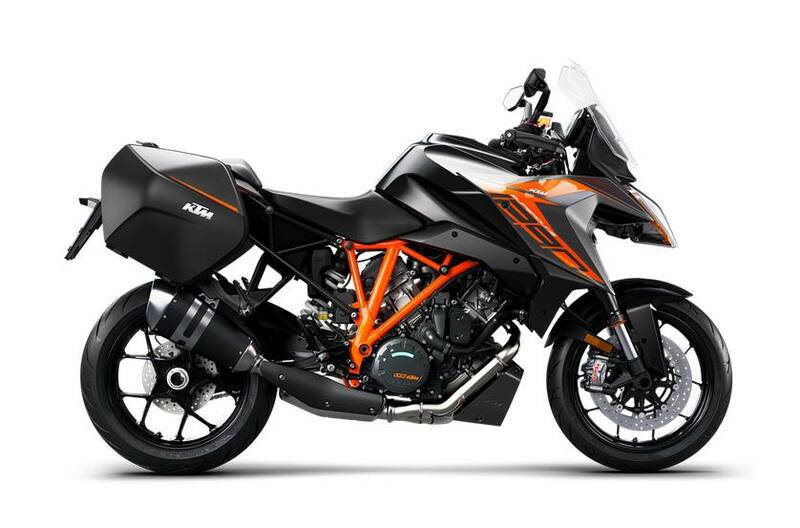 The KTM 1290 SUPER DUKE GT is built for covering ground quickly and comfortably. 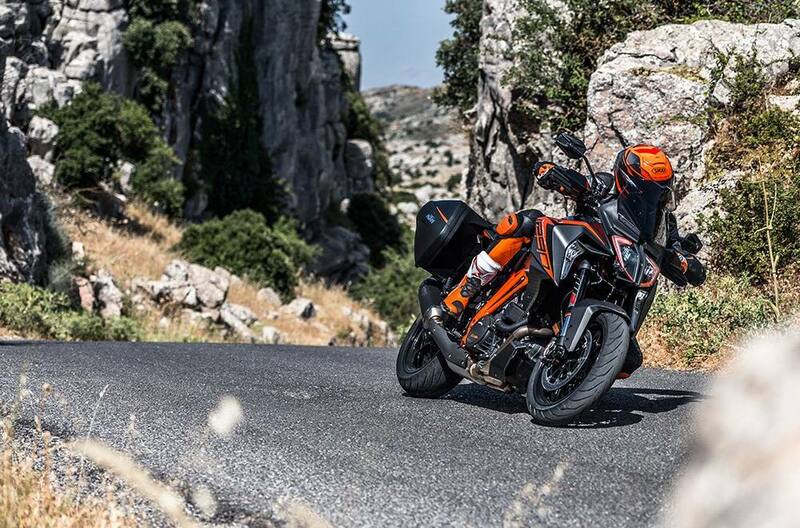 Thanks to its refined ergonomics, electronically adjustable suspension and impressive tank range, the SUPER DUKE GT is the perfect travel companion. 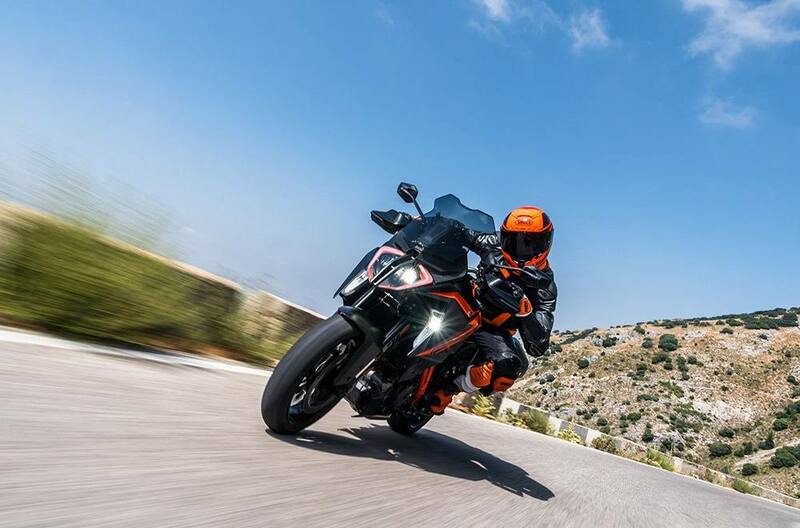 Engineered to support a pillion, as well as full-loaded panniers, the subfame on the KTM 1290 SUPER DUKE GT ticks a number of key hyper-touring boxes. The single-sided swingarm on the KTM 1290 SUPER DUKE GT is not only the lightest in its class, but also meticulously manufactured and generously dimensioned - a reassuring nod to spirited long distance travel. 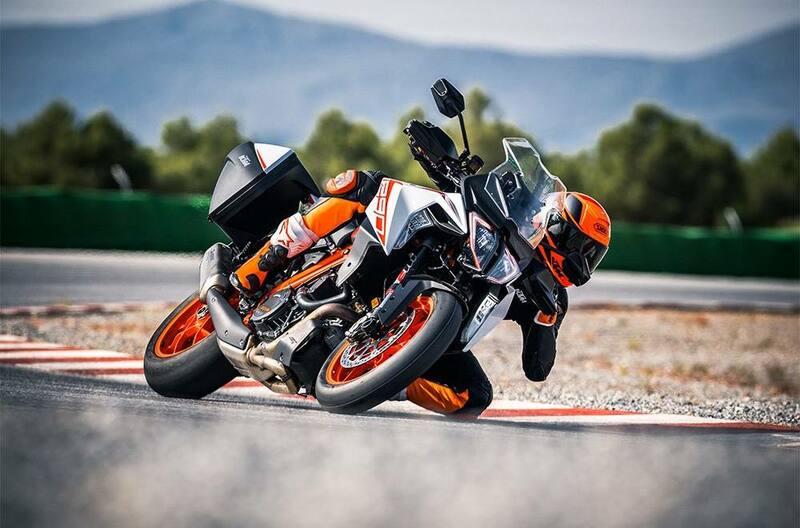 Intelligent Suspension: Innovative WP semi-active suspension with a new setup for perfect comfort, safety and adjustability on the KTM 1290 SUPER DUKE GT. This allows the rider to easily adjust suspension settings at the push of a button, with advanced sensor wizardry taking care of the details. Other than the expected ‘Comfort', ‘Street' and ‘Sport' settings, the rider can also take extra pillion weight into account, with the SCU (Suspension Control Unit) adapting the damping, load and anti-dive rates in real-time. It also monitors rider position, using information provided by a set of stroke sensors and accelerometers to ensure optimal suspension performance in all conditions. If you've been on the road long enough, you'll almost definitely come across a rough patch of tarmac. Thanks to a reliable and sensitive WP steering damper fitted as standard to the KTM 1290 SUPER DUKE GT, unpleasant kick-back through the bars is significantly reduced. Guardian Angels: The Pirelli Angel GT's fitted to the KTM 1290 SUPER DUKE GT offer a perfect fix of touring and sporting qualities. These tubeless sport touring tires are fitted on alloy rims which are manufactured in a low-pressure die casting process. Not only do these featherweight wheels make the bike lighter overall, they also minimize the unsprung masses and moment of inertia for improved, and safe, handling. Stopping Power: More than adequate deceleration is ensured at the front wheel by the two radially mounted four-piston Monoblock calipers gripping floating 320 mm discs. The spacing between hand brake lever and handlebar is adjustable so that the lever is always within easy reach for every rider. The front brake receives effective support from the disc brake on the rear wheel, which features a 240 mm diameter disc and a two-piston caliper. The enormous potential of the brakes can be exploited to the full thanks to its sportily tuned anti-lock braking system. The ABS even has a supermoto mode, for when you absolutely feel like backing it in while on holiday. Hit The Long Road: The 23 liter, long range fuel tank, in combination with the low fuel consumption of the 1290 v-twin engine, easily provides hundreds of kilometers of exciting riding without caring about a fuel station; an important benefit for touring in desolate regions. The fuel tank also protects the rider's lower body from wind and weather for added comfort mile after mile. Fit for purpose. 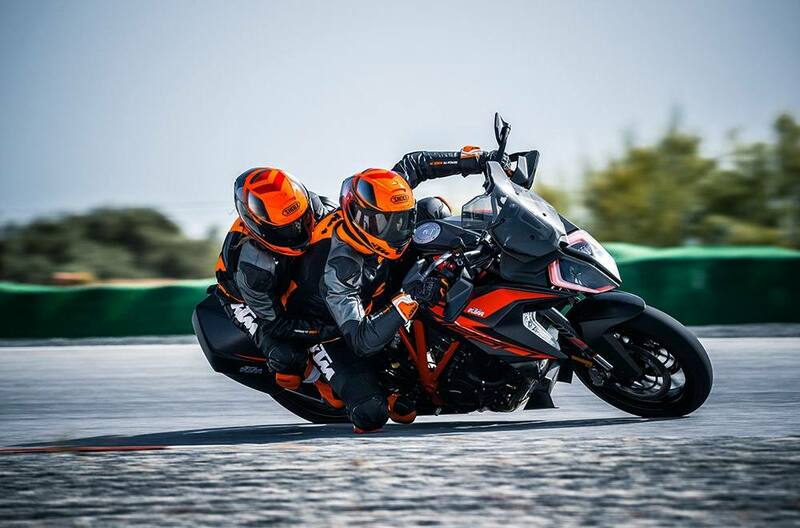 The KTM 1290 SUPER DUKE GT concept of long-distance performance riding would never succeed if it could not balance high-performance riding with long-distance comfort. To achieve this, the GT is designed for ease of movement and simple adjustability while piloting the bike. Add in the flexibility needed to cater to either one or two riders and you'll understand what makes the GT the ultimate long-distance cruise missile. The brake and clutch levers can be adjusted in several positions, allowing riders to find that sweet spot of comfort and control. The on-board computer's menu pages are selected and operated using the four control keys of the mode switch on the left handlebar grip. It's very simple and intuitive: "up" and "down" scroll through the menu, the left button selects the desired item, the right confirms it. The Exit key on the left of the mode switch can be pressed at any time to return to the previous menu level. Child's play, basically. Center Point Of Control: Riders can choose three positions for the brake and shift lever to accommodate a variety of boots sizes, or to simply find their perfect shifting or braking preference. 9-Way Adjustable Wind Protection: An all-new windshield design gives the rider maximum protection from the elements, and reduced wind noise at speed. An improved windscreen adjuster has also been developed, giving riders 9 positions of adjustability, while keeping one hand on the throttle. Designed to devour unlimited kilometres with optimum wind and weather protection, the KTM 1290 SUPER DUKE GT is a bona fide grand tourer. New tank side panels, with storing compartments and USB charging hub, add to the KTM 1290 SUPER DUKE GT's state-of-the-art finishing. It's definitely one of a kind. Beastly Makeover: An all-new headlight mask and redesigned screen. The KTM 1290 SUPER DUKE GT has cornering lights integrated into its fuel tank. These consist of three LED segments, using the lean angle sensor of the MSC system as a trigger. Depending on the lean angle, the KTM cornering light can use up to all three segments, always giving the rider the perfect view to where he/she is going. Integrated in the cornering lights are also LED indicators, which give the KTM 12090 SUPER DUKE GT a unique and exclusive look. The KTM 1290 SUPER DUKE GT gets a full color, tilt-adjustable 6.5" TFT Dashboard, derived from fellow stablemate, the 1290 SUPER ADVENTURE. This gives riders a full view into all information pertaining to the motorcycle, from ride modes to turn-by-turn navigation via KTM MY RIDE. The display layout has also been newly designed for the 1290 SUPER DUKE GT and finds the right balance between information and style. Oh, and have we mentioned that it's an award-winning device? Keeping the KTM 1290 SUPER DUKE GT under total control while you exploit its full potential - that's what the unique electronics package of this motorcycle allows. Lean-angle sensitive electronics intervene to provide maximum grip and optimum traction under braking or acceleration - letting you hunt horizons and chase superbikes with confidence. The ultimate in safe deceleration. One component of the comprehensive BOSCH MSC assistance package is the lean-angle sensitive cornering ABS. Based on the high-quality 9ME modulator, it unites the talents of combined front and rear wheel braking and lightning-quick, efficient pressure modulation with the high quality Brembo hardware to make the most advanced braking system on the market - no-one brakes more progressively or safely, even at extreme lean angles. As its name implies, the TPMS monitors tire pressure, and gives you a view of current pressures in the TFT display. In the event of sudden loss of pressure, for example due to tire damage, a warning will alert the rider on the dash. Take the KTM 1290 SUPER DUKE GT as far down the road as you dare and modify it to suit your personal style with the KTM PowerParts range of accessories and luggage options. Developed specifically for individual KTM street models, all KTM PowerParts perfectly complement the rider and provide that important ‘factory fit' straight from the dealer. NUVIZ is the first fully-integrated head-up display (HUD) designed specifically for the needs of motorcycle riders. It displays customizable information in the rider's natural line of sight and features an intuitive eyes-on-the-road handlebar controller and built-in HD action camera. NUVIZ also brings together all of the important functions of your navigation, communication, and media devices into a single viewpoint, allowing riders to stay connected, but not distracted.